Our moving process has just about come to an end. The painter was back for touch ups today and the last light will hopefully be hung next week. I have had the boxes unpacked for a while, but we are still (I am still) finding a place for everything. I have said it before and I will say it again, while I love my new home and am ever so grateful to have had this opportunity, the best part of this move has been releasing. I tell you, this recovering perfectionist has learned a lot about releasing over the course of the past three years-releasing people, feelings, situations… The icing on the cake has been releasing stuff as we have prepared to move. I feel twenty pounds lighter (in my dreams, and that’s another blog post for another day). My family has embraced this process and I can honestly say I do believe we are down to having in our home only those things we love and find to be useful! I was born with an innate desire to have order and simplicity. I’m not one to like chaos, although I love change. I’m not one to like collections. I’m not one to like lots of color and pattern, in my home or on my person. I feel better when things are fairly simple (my girls say ‘boring’). Piles do not energize me. They drain me, as if calling out to me, “One more thing to do!” While this innate desire for order and simplicity has driven me to a love of organization, I truly embrace organization because of the life it enables me to live. I don’t ever want my home, my blog, my speaking engagements, etc… to prompt anyone to go home and begin organizing so they can present a certain image, or think it is a must do. I don’t want any of us to emulate the pristine pictures in magazines or on Pinterest. My prayer, my hope, is that anything I write, say, picture, about organizing creates a longing in others for peace, for a life that is fully lived. I love being organized, having an organized home because it frees me to serve others, to use my home as a sanctuary and place of refreshment and nourishment. Over the course of the next few months I thought I’d give you a glimpse into our home and along the way pass along some of my tips for keeping things ordered. Today we will start at the front. 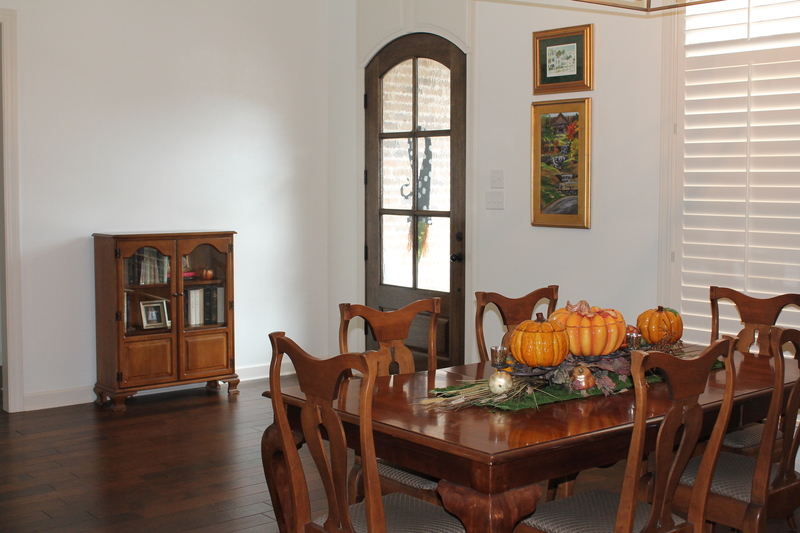 Our front door opens into our entry and dining room. This home has been a challenge. We have moved from a two story English style home, with lots of separate rooms, to a more English country open, one story floor plan. I love it, but boy does it ever beg for order. I have yet to find an entry rug I like, nor have I landed on what to put over/behind/with the small silver chest on the entry wall. 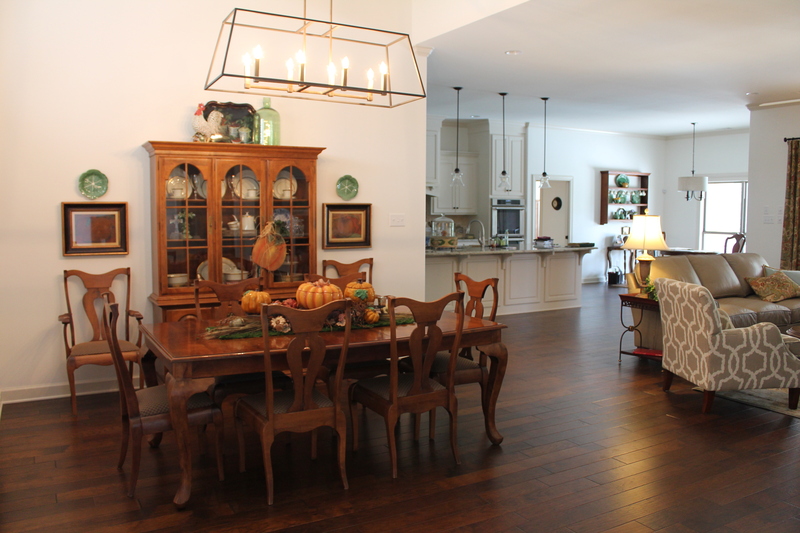 We have 14 foot ceilings in the entry and dining. I love the expanse. I feel like I can take a deep breath and relax when I walk in. I decided in this home to move away from the more traditional English colors I had used in the past, deep reds, navy blues, deep greens, and gold. I moved completely out of my comfort zone and went with tone on tone. The trim is slightly darker than the walls. It is a greige. I think that’s what they call this new trend. The walls are subtle taupe/white. We have a lot of family wood pieces and I wanted those items to pop and yet the home to feel light and slightly more modern. Not sure we pulled it off completely, but it is feeling like home and we all like it. Our dining room is a big part of our home. Not in terms of space, but in terms of how we live. We LOVE to entertain, and so our dining room really does get lots of use. I am blessed to have a 1960 Ethan Allen dining set once owned by my mother-in-law. In fact, it was her gift to us just two short years before she passed. I treasure it. I love the simple lines. She loved order as well, so she had great storage pieces. There is a bar cart my husband’s father still uses, so I don’t have it yet, but one day the set will be completed again. We keep our dining table extended, ready for seating 8. I love to decorate for the various seasons, but always try to keep the decorations centered on the table, so nothing has to be moved in order to use the table. It just makes life easier. I like to throw a few books and decor items in the china cabinet, but by in large, I store china and crystal in the china cabinet. It keeps it safe. It keeps it close at hand for use. For those of you who never use your china, I’m gonna let you in on a little secret. I got to meet and hear a Royal Doulton VP speak shortly after I got married. A real treat. He took a china plate and through it on the floor. It didn’t break. He took a piece of every day dishware, through it on the floor and it shattered. Bone china is actually very strong. It is resistant to chipping and breaking. Now, if you slam it up against the granite counter, well, no help there. My point is, while it may look fragile, it really isn’t. I could go off on a whole other path here spiritually comparing women to bone china and reminding us how very strong we are, but… I also learned that bone china is dishwasher safe. I heard you gasp. And yes, my grandmother and mother just might faint. It is the truth. bone china, even with gold or silver banding is dishwasher safe. The trick? DO NOT use dish detergent with lemon in it. In all actuality using dish detergent with lemon in it is bad for ALL your dishes, glass ware, cookware etc… The lemon causes pitting. Use the plain Jane dish detergent. I use the good old Cascade plain. I have for 24 years and my china is as beautiful today as the day I got it. My gold bands are in tact. The second secret is to let it air dry. Adjust the setting on your dishwasher-it’s simple. I tell you all of this to say-USE YOUR CHINA! Why have it, why store it, if you are not going to use it? If it just isn’t you, not your taste, you registered to get your mother off your back, then take a deep breath and let it go. If you love it, dream of using it, then get it out and USE IT! 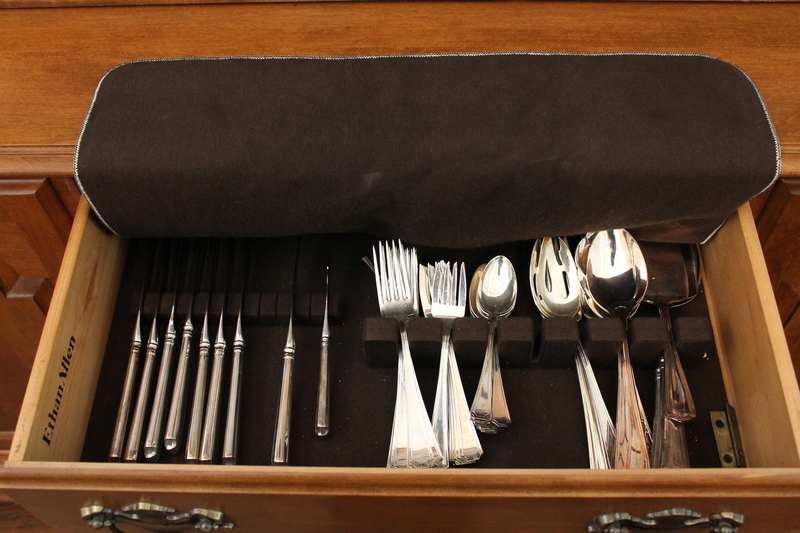 I keep my silver in the silver drawer. You can buy replacement liners and/or spray for the liners at the Container Store. This keeps my silver from tarnishing quite so quickly. Again, I keep it here so I will use it. And we do-even a little tarnished. 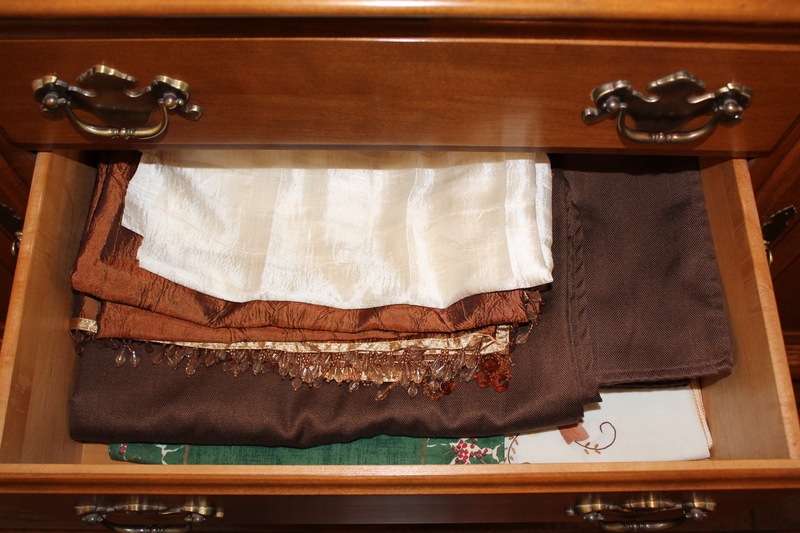 I also keep our table cloth, chargers, table runners, box of plate stands etc… and a box of candles in the cabinet. I literally have everything at my finger-tips when needing to set a quick table or prepare for a festive gathering. 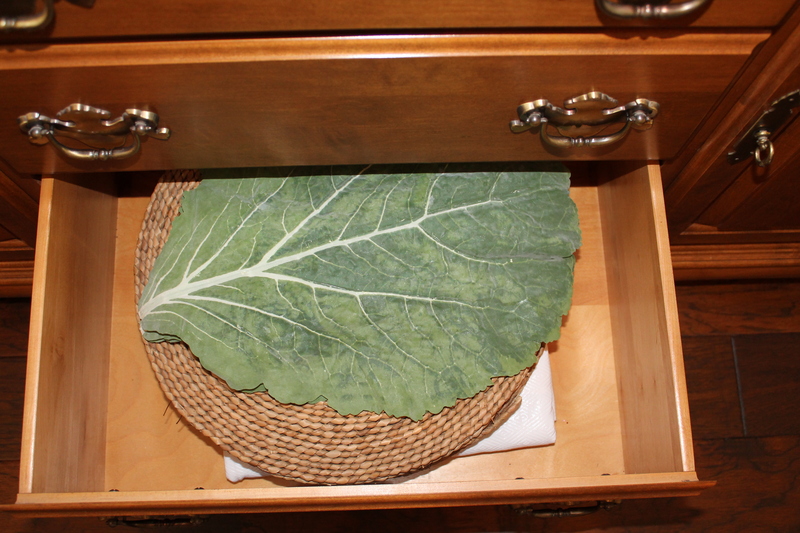 You’ll notice the table cloth drawer is not full. I keep a cream table cloth and a brown one. That’s it. I have found those two meet my needs. And in all honesty, more often than not we just use place-mats or chargers. I know there are TONS of gorgeous table cloths out there. I know many of you have drawers brimming with them. My question is, “Why?” Do you use them? How often do you think about using them, only to decide you don’t want to iron them or you don’t want them to get dirty. My challenge to you is this-free up the space. Get rid of them. Life is way too short to fret over table cloths. Keep the one or two you REALLY use. Release the rest. I change out the art next to the china cabinet by season. It’s an easy spot to add some holiday decor, yet doesn’t clutter things or require moving a lot of other stuff around. 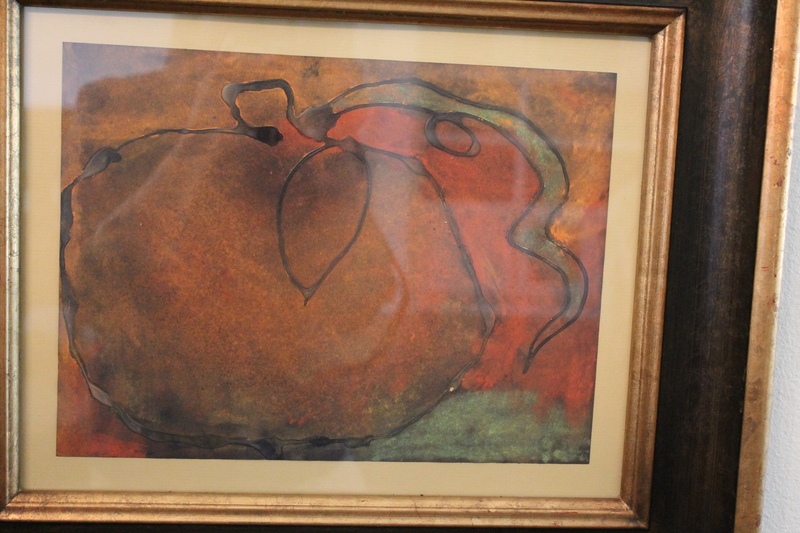 During the fall I actually have framed pumpkins my kids did back in the 3rd grade. I loved the look of them and as a mom, I struggled during those elementary years with storing their art. I actually have quite a bit of it framed and we use it in our home. It’s amazing how many comments we get. I love it. My girls love it. One day I hope their children will love it and be inspired. As I have sought to become less of a perfectionist and more of an organized mom seeking peace, beauty and a full life, I have come to realize that having less often means having more. Our dining room is fairly simple. I have let go of a lot of stuff-and I am ashamed to say so. Good grief the decorations, table cloths etc… I have spent money on. Oh well, lessons learned. As you can see. 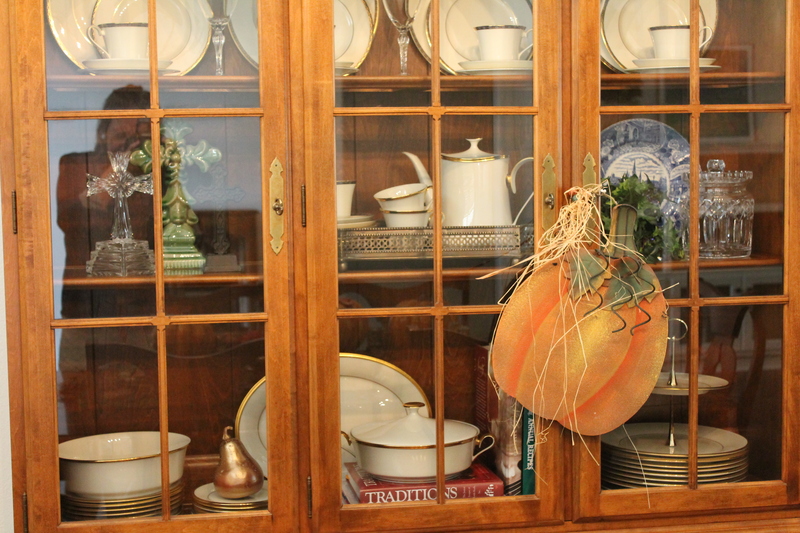 I use every inch of the china cabinet and keep the table open for guests (which also means I don’t have to store the table leaves). I have tried to be creative with my kids’ art, saving money at the same time. 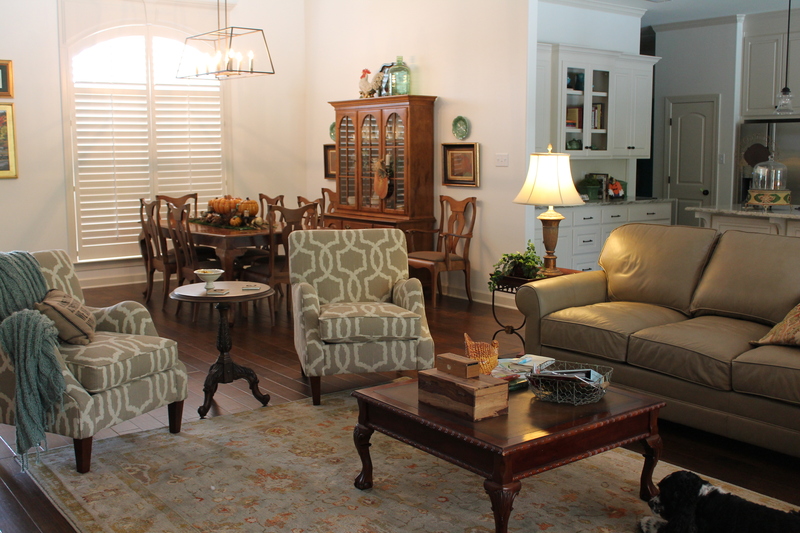 While simple, we love our dining room and we use our dining room. We serve friends and family there. We play games there. On occasion the table is cleared and we work on scrapbooks there. We enjoy it. And that dear friends, is a full life. I challenge you to rethink your dining room. If it’s really not your style to have one, then repurpose the room. I have helped a client turn hers into a craft room. A friend of mine uses hers as a billiards room. If you want to use your dining room, then do. Clear out the chests, get rid of the excess. Use it, enjoy it. Your living room rug is so pretty. I have struggled finding one because of not being sure of the colors in real life vs. what I see on the monitor. May I ask where you got yours? Thank you. I purchased it in Little Rock at a store called Alladin’s rungs. It is very muted-which was what I loved about it.